I am trying to convert this page to a single-page, 19 x 13 pdf file. I am running Firefox under Ubuntu and trying to use the Print To File option, but it is splitting the web page into multiple pages. Is there a way to get the page into a single-page pdf with the given dimensions? Edit: I already tried setting the page dimensions to 19 x 13 using custom page size. The only noticeable effect is that each page now has more whitespace, but the page is still split across multiple pages. Also, I already saw the answer suggesting the Abduction plugin, which works, but I prefer a pdf because it is more scalable. 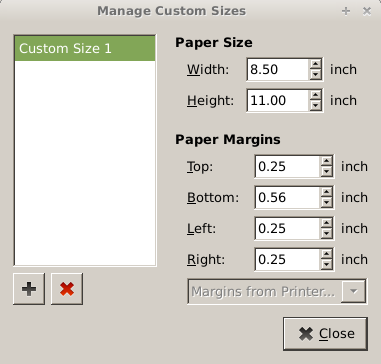 In "Page Size" drop down list choose last option called "Manage Custom Sizes"
Use Scale function in Page Setup window and scale down the original page. In this case it is important to untick the option "Ignore Scaling And Shrink To Fit Page Width" on Options page. Not the answer you're looking for? Browse other questions tagged ubuntu firefox pdf printing html or ask your own question. How can I save a web page as single page PDF? Open office spreadsheet, export as PDF as single large page? How can I split in half a double-page scanned PDF in a single pass? How do I print a web page as a PDF from Firefox (using Adobe) without the URL in the footer? How can I print a large image to multiple pages on mac os?